These drawings are examples of a Pennsylvania German tradition of decorated manuscripts known as fraktur. 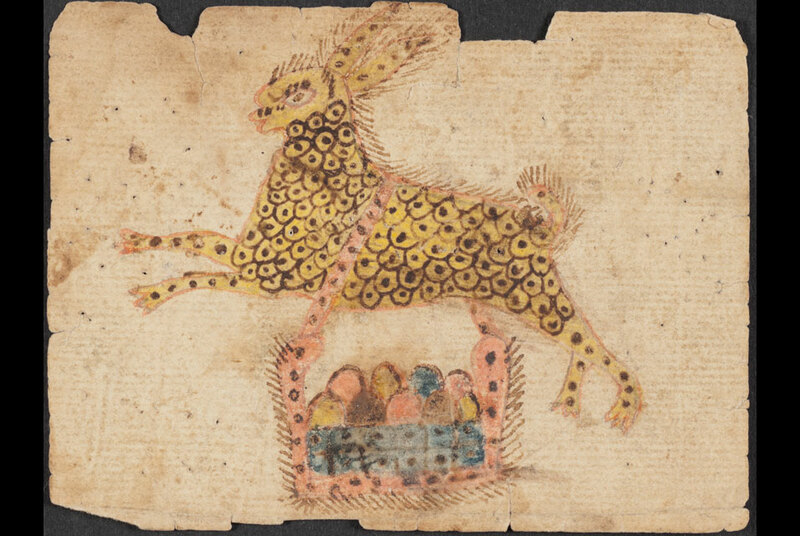 WINTERTHUR.- Winterthur Museum recently acquired one of the earliest known American depictions of the Easter Bunny, which was sold at Pook & Pook auction house in Downingtown , Pennsylvania . Together with the Christmas tree, the custom of the Easter rabbit and colored eggs was brought to America by immigrants from southwestern Germany in the 1700s, and has become a favorite American tradition. This delightful image is attributed to schoolmaster Johann Conrad Gilbert (17341812), who emigrated from Germany in 1757 and ultimately settled in Berks County , Pennsylvania . He likely made the drawing as a gift for one of his students. A similar drawing, also attributed to Gilbert, is in the collection of Colonial Williamsburg. These drawings are examples of a Pennsylvania German tradition of decorated manuscripts known as fraktur, which include birth and baptismal certificates, family records, writing samples, and bookplates. Lisa Minardi, a fraktur expert and assistant curator of the museums current exhibition, Paint, Pattern & People: Furniture of Southeastern Pennsylvania, 17251850, notes, The Easter rabbit drawing is one of the rarest of all fraktur, with only two examples known, and is a major addition to Winterthur s collection. This important acquisition allows Winterthur to document the Germanic beginnings of a beloved American tradition, adds J. Thomas Savage, Winterthur s director of museum affairs. The drawing will be on view in the museum Galleries starting Thursday, April 21. It will remain on display through the Easter holiday and Mothers Day, when it will be taken down and treated by the museums conservation staff to remove dirt and grime from the paper. Ultimately, it will be placed on long-term view in the museums renowned Fraktur Room, where it will join about two dozen other examples of Pennsylvania German fraktur art.